Now I know what you may be thinking – WHAT? We don’t need no steenking catalysts. But ya see, that’s the rub – those track days at the ‘ring are lots of fun, but you’re not fooling anyone when the people in the lunch line at Laguna Seca can smell your exhaust. I’ll be the first to say that catalysts serve a great purpose and beyond the evils of over-restrictive cats on stock vehicles, can be a great addition to any performance vehicle. 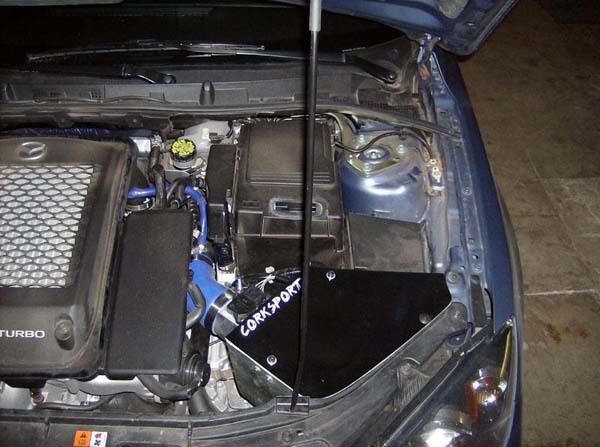 At CorkSport we have been listening to you, our customers, and there seems to be an interest to have the performance of a racepipe without the foul, eye-scorching smell of fuel every time you cold start the vehicle. Well, you’re in luck – we’ve recently found a source for high quality metallic substrate catalysts in a compact yet high flowing 410 stainless steel package and we plan on offering a range of products that provide these catalysts as a configurable option with our current line of racepipes. Catalysts: How they work and their failure modes. A catalytic converter is a device resembles a muffler or resonator – basically an enlarged section of your exhaust system that has a honeycomb structure held inside of it. The honeycomb is then coated with a substrate that creates a chemical reaction based on heat and any unburnt fuel in your exhaust system. Anyone who has used a propane space heater – the kind that glow and don’t really give off any tangible flame – has seen a catalyst at work. Substrate and brick/insert design is relatively straightforward – the more surface area you have, the more efficient the catalyst is at burning unburnt fuel. In the search for more surface area, the density of the honeycomb increases – as does restriction of the system. This honeycomb comes in two forms – a metallic stainless foil version and a ceramic version. Based on the manufacturing process, the ceramic version must be retained in the canister with a fiberglass or vermiculite packing material around the circumference of the ceramic ‘brick’. In rotary and turbocharged applications, this material often deteriorates from excess heat and pressure allowing the ceramic substrate to rotate and/or crack. Our catalysts utilize a 200 cell metallic substrate design and have the honeycomb material all the way to the wall of the canister without any additional packing material that may deteriorate. The metallic spiral is held in place mechanically from either end to prevent movement. The canisters and tubing are made of 410 Stainless Steel and all carry a 5 year manufacturers warranty. 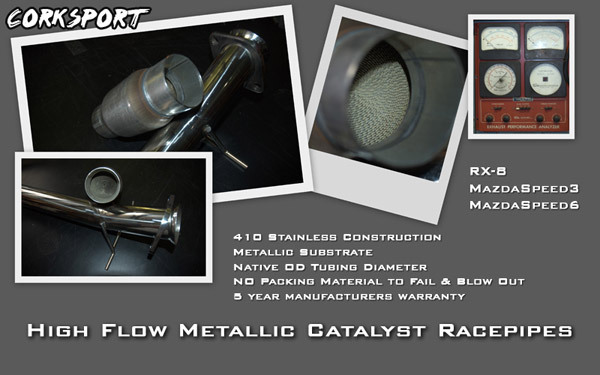 To start with we will be offering the RX-8 Power Series Racepipe in a single resonator/single 65mm catalyst configuration (as well as a single or dual resonator configuration). We’re in the process of doing the first production run on these and hope to have them out in the next two or three weeks. The next product we will be working with is the Mazdaspeed3 Racepipe with 80mm high flow catalyst, this should be available in the next month in production quantities. 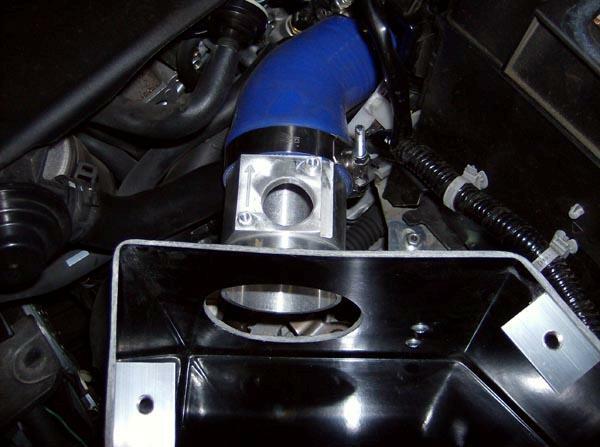 Finally, we are also working on Mazdaspeed6 Racepipe with 80mm high flow catalyst. Drop me an email if you’re interested in getting in on these products hot off the mandrel – we’ll have a handful of pre-tested prototypes and then full production runs of all of these products within the coming months. I have to admit at first glance the Mazdaspeed 3 looked a little “off” with the smile in the front bumper. After spending quite a few hours with the car I can tell you with a straight face, you don’t even notice it. This may be different on a Mazdaspeed 3 that is not Black Mica like ours, where there is a bigger contrast in color between the car body and the bumper insert. What I can tell you for sure is that cleaning the front bumper is not a lot of fun. Bugs get wedged in the strakes inside the insert quite easily and at weird angles. You have to get down low to get them all out of there. The wheels are not bad to clean nor is the rest of the body. The rear wing is an interesting design, it is basically a smaller wing with another wing over it. Driving the car is great. The car seems to be planted better on the road compared to the older Mazdaspeed 3. I had a chance to go through some decent corners and get on the throttle a bit. You can feel the differential really pushing the outside tire to get you through the corner. It is quite a rewarding feeling having the car urging you to go faster. The car almost begs you to take a corner as fast as you can. The only two initial changes I would make to the handling are to make the Mazdaspeed 3 a little flatter in corners with some larger sway bars, and lower it around an inch or so to close up the wheel gap. The Dunlop SP 2050 tires seem decent but I have not had a chance to really push them to the limit to see what happens. The exhaust note is very subtle and is quieter than the older Mazdaspeed 3 stock exhaust. You get a a small hint of the flat exhaust note but not a lot. The dual tips are also much nicer than what the pre-release pictures showed. The angle of the tips matching the bumper contour was a nice design touch as well. There are a few items I wish Mazda would have given the North American market. Being that the sport model is the only version available we were not able to get the HID headlights and LED tail lights with the car. We’ll have to wait and see what kinds of options become available and see about changing the lights out with something better. On the plus side this is the first car I have had to actually “speak” with the car to setup the Bluetooth, and for making phone calls. The navigation works well from the limited places I have driven so far. I really love the boost gauge. It is a nice throwback to the old style of the turbine boost light from the 323 turbo. So now that we have the car what are we going to do with it? Maybe a better question is what we are not going to do with it. We have quite a few projects planned for the new car. If you want to follow along with updates to this project and other CorkSport products be sure to sign up and follow us on Twitter at https://www.twitter.com/corksport or click the “Twitter” buttons above and below. Just a quick update as to what we’ve been working on our here at the shop. 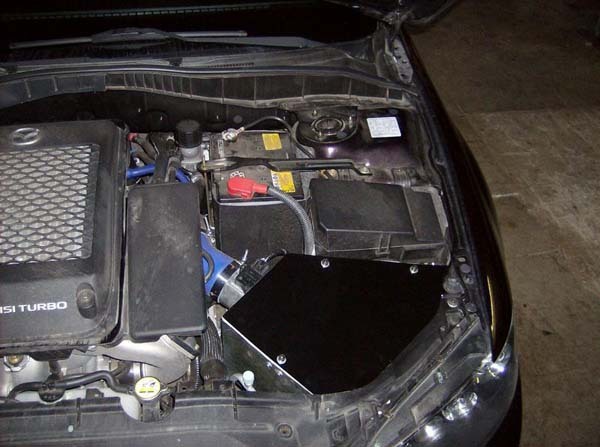 I built an air box for our short ram intake for you MazdaSpeed 6 and the MazdaSpeed 3 guys. I built it as a full box but with a removable top so the air filter can be easily removed for cleaning. 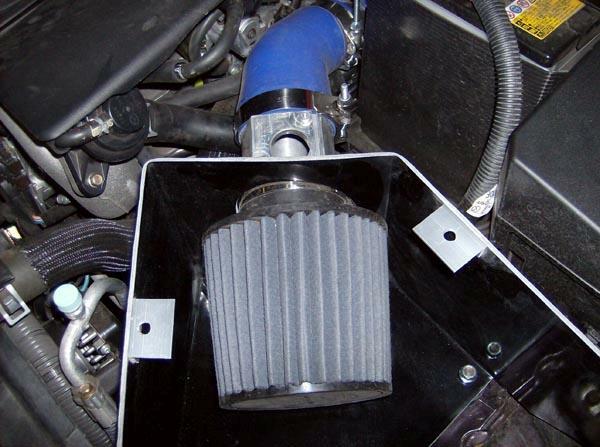 The use of the air box will help keep hot engine bay temperatures from entering your intake system. In my preliminary testing, a 2 to 4 degree drop in intake air temperature at cruising speeds was measured with the air box installed versus not being installed. Hope that those of you that end up purchasing it, enjoy it! That’s all for now, tune in next time for more updates from the shop!